Singapore is spread across 63 islands with tropical rainforests and a climate to match. As such the Singapore Forces who act as a deterrent to possible aggressors, have required an Amphibious Armoured All-Terrain Vehicle and the Swedish Bv 206 had been fulfilling this role. 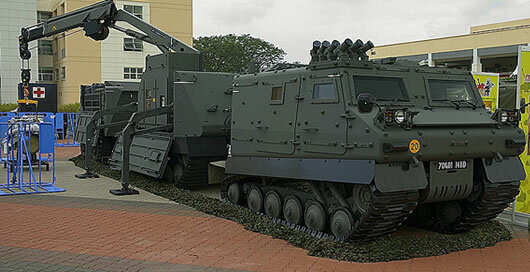 However the Singapore Forces have been going through a modernization program over the last few years to bring their equipment up to a 3rd Generation standard, which has included a new Amphibious Armoured All-Terrain Vehicle called the Bronco. Mortar carrier, fitted with the 120-mm SRAMS mortar (the world’s first recoiled mortar to incorporate a blast diffuser reducing the blast overpressure effect generated by normal mortar fire, which now allows for a longer period of firing without injuring the mortar crew). The Bronco offers the same principal advantages of Amphibious Armoured All-Terrain Vehicles, wide seamless rubber tracks, providing a low ground pressure and ease of moving across harsh, wet or soft terrain. A full amphibious capability within minutes of preparation and a top water speed of 5km/h. In its troop carrier variant it can carry 16 troops (including the crew) whilst the rear section can be manufactured in the above variants. It has a top road speed of 60 km/h and 25 km/h off-road. It’s offensive capabilities are limited to a roof mounted 7.62mm GPMG on the front section of the vehicle. The driver can operator forward smoke grenade launchers. It’s armoured protection can withstand 7.62mm rounds and airburst artillery splinters. The Bronco’s advantages over other Amphibious Armoured All-Terrain Vehicles are its engine and potential armoured protection. It is powered by a Caterpillar 3126B turbocharged diesel engine, generating 350 hp thus allowing the vehicle to be equipped/up-graded with an increased level of protection not available on other Amphibious Armoured All-Terrain Vehicles such as the Viking currently deployed in Afghanistan with British Forces, which has sadly seen the loss of British Troops. Its for these reasons that the British MoD placed an order for 100 Bronco’s in October 2008 at the cost of £150 million. The existing Vikings will then be pulled from front-line service to fulfil the role of training in the UK. These Bronco’s underwent a number of modifications for compatibility with British Forces in the UK prior to their deployment in Afghanistan, such as Battlefield Management Systems and electronic counter measures, creating a new beast for the British Army, designated The Warthog. With the end of The Afghanistan War, the Warthogs are being converted in to Artillery Radar to detect counter-battery fire.